Here's another one. Pretty experimental, but ultimately very rewarding. Some parts are definitely harsh, but not quite as crazy as a typical Mr. Bungle/SC3 album. Very enjoyable overall. 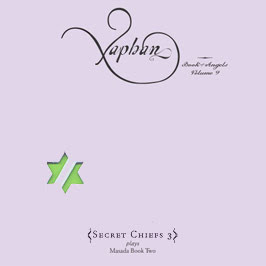 Spruance, best known as the guitarist for the seminal avant-rock band Mr. Bungle, has in recent years been principally absorbed with the Secret Chiefs 3, a project that, like much of Zorn's best work, defies categorization. Spruance has performed for Zorn now and again, although I have to confess that after hearing his criticism of Weird Little Boy (a little digging online will uncover details), I did not expect another collaboration. But we did get "Xaphan", and am I grateful. Spruance takes eleven of Zorn's Masada compositions and brings them across the world and back again, stray traces of funk, surf, world (particularly Arabic), techno and a thousand other sounds blend seamlessly together to form a cinematic soundscape. The album opens with a deep groove established by bassist Shahzad Ismaily and drummer Ches Smith on opener "Sheburiel" and pretty much never lets go. It manages to be cinematic and mournful ("Barakiel"), full of stunning performances (Rich Doucette's sarangi solo on "Bezriel", Spruance's guitar leads on "Labbiel") and the expected great melodies from Zorn ("Asron" is of particular note). In many ways, the album accomplishes what I felt Koby Israelite's Orobas: Book of Angels, Vol. 4 was trying to do. I think in the end, this is one that anyone who might be interested in it will be really happy with-- "Xaphan" is a fine example of just how extraordinary both Zorn is as a composer but also of the arranging skills of Spruance. Highly recommended.